You are here: Home / Ethnic Groups / The People of Maluku / Who are the Lisela? Most Lisela live on the northern and eastern coasts of Buru Island. Some live on Ambon. Both Buru and Ambon islands are part of the Maluku Islands. 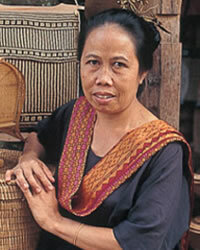 The Lisela are sometimes called Buru, Buru Utara, Li Enyorot, Liet Enjorot, or Wayapu. They speak the Lisela and Tagalisa dialects. The Lisela live in a region marked by tropical rain forests and savannahs. Most of their income comes from cultivating cloves, nutmeg, copra, coffee, cashew nuts, and cocoa beans. Some Lisela get their income from fishing. The melaleuca tree, from which melaleuca oil is made, provides an important source of income. There is a melaleuca refining industry on the island, with exports to foreign markets. This provides a substantial amount of foreign income. However, the owners of the refinery, the traders, and the middlemen in the cities generally secure the largest share of the profits. The inhabitants of Buru, where the Lisela live, are working hard to create a more prosperous environment for themselves. Buru Island is forecasted to become a top rice producer for the Maluku region by the year 2020. Agricultural yields are expected to fulfill 40% of the total 400,000 tons of food needed for the Maluku Islands. Surrounded by the Seram Sea and the Banda Sea, Buru is strategically located. In addition to agriculture, the fishing industry could be better developed, using the wealth of sea resources available. The southern coastal regions are currently directing their energy toward becoming a center of the fishing industry. Transportation to the Lisela area is no longer problematic. Goods and services to and from the islands around them are available by way of ferry, and air transportation is offered on a weekly basis from two airfields. The Lisela are Muslims. They seek to be faithful in fulfilling the demands of Islam. They also follow their traditional beliefs. This combination is visible in their wedding ceremonies. For example, the ceremony called minta bini (ask for a wife), is carried out in the traditional way by extending a greeting of mata rumah, completing prescribed local rituals, and then ending with an Islamic prayer. Although the Lisela people are the original inhabitants of Buru Island, many outsiders and their enterprises have dominated more and more of the island’s resources, so that the Lisela are less and less able to benefit from their island’s wealth. Education is a primary need, so they will be better able to find employment. There are also significant needs for new technology and training. This is especially needed for those who work in plantations, so that they can obtain maximum crop yields.